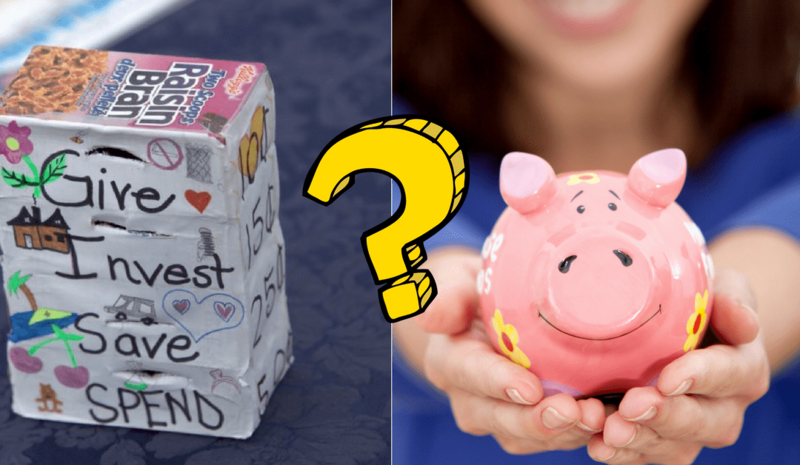 The piggy bank is a very valuable tool for teaching kids the concept of saving and delayed gratification, both of which are fundamental to developing self-control when managing money (and life!). While very important, these factors are just one facet of creating good habits from a young age. Learning how to manage money for different purposes, while also defining one’s goals and personal values can start young too, here’s how. The GISS Method of Managing Money involves dividing income into four main purposes: give, invest, save and spend. These are the four main categories many happy, generous, high net worth people tend to divide their money into – and even a young child can do it. The process brings consciousness to defining personal values and decision making. Managing their money for different purposes helps them define who they want to be by giving them an easy method to help them clarify what they want, why they want it, and what they need to do to achieve it. For children who build a GISS bank or decorate jars, they literally create a functioning vision board. They can draw pictures, attach photos or stickers of the things they’re saving for, along with causes that matter to them, and investments they may want when they’re older. We see kids draw animals and hearts on the giving section quite often, sports equipment and travel destinations for saving, and gold, hotels, and stocks for investing! Kids around the globe are making these banks. Creating this clarity is one of the greatest challenges our youth face right now in this very fast paced, highly stimulating and somewhat confusing world of technology and endless amounts of information. Setting a clear goal helps them focus their thoughts and their energy on what they want, not on what they don’t want. That clarity of focus can help give them a feeling of direction and excitement along with optimism – and this is important at any age. 3. Instills a process for discipline and self-control around managing money in the present and for the future. Saving has been shown to be one of the best ways to develop impulse control and researchers have found it to be directly related to financial success in adulthood. The GISS Method also ensures they are creating a category for their future with the investing segment. Even if they don’t invest the money for many years, the consistent habit of putting small amounts away will provide them a base to start with. 4. Teaches the key financial lesson that money isn’t just for spending. The system of dividing up their money expands their thinking and allows them to experience the process of using their money for other purposes, a framework for the future of giving, investing and saving. Giving to help others has been shown to help increase self-esteem and happiness through the act of focusing on others and not just ourselves. Putting a portion away into an investing jar or account teaches that money isn’t just for material items, it’s to invest grow for their future. Saving allows them to set and achieve goals that matter to them, and spending helps them learn to manage their money for day to day needs and wants. While saving with a piggy bank is a positive step, saving for things along is not enough to provide a good financial framework for adult life. The young generations must also put aside money for their future to invest so they have money to live on when they’re older and no longer working, they can’t rely on a corporation or the government to take care of that. They can also significantly enhance their feeling of abundance, happiness and meaning in life by giving a portion of what they earn to causes that matter to them. 6. Through managing their own money they learn the cost of things. Learning the value of money generally won’t happen until it goes through their hands. Through this experience, they’ll begin to learn about good and bad quality items, opportunity cost, and they will also begin to get perspective on how to get value for their dollar. Many young adults move out of their parents’ homes with little understanding of what life costs, and end up struggling to make ends meet. This is when they are at major risk of going into devastating debt, often quite quickly. Basic mental math skills are sorely lacking in a large portion of our society now, and technology is making it worse because it’s doing the work for us. An example of this is giving tips at a restaurant, we used to work it out ourselves. You may have seen a cashier or waitress struggle to give back change if their machine isn’t working. Lack of experience and practice is the main reason this is happening. Through dividing their income, your kids will learn the basics of determining percentages by starting with the “whole” 100% at the start. This is an extremely important skill because percentages are the basis of understanding interest rates, a key concept in personal finance. Interest rates impact everything from credit card and bank fees to home mortgages and the return on investments. The real-life experience and perspective developed by managing their money gives our children the opportunity to experience different results – and the opportunity to figure out how to manage those results and look for new solutions if they aren’t what they had hoped for. It’s in that moment where things don’t go their way and the outcomes aren’t what they want that real development often happens, and it’s going to be a lot easier on them in the long run if they learn those lessons when the risks are low with ten dollars or fifty dollars, rather than ten thousand dollars or more. It’s absolutely key that instead of getting depressed and down, or beating themselves up they instead learn to say to themselves, “OK, that wasn’t the outcome I wanted. How can I do this differently? What did I learn from this? What solutions can I try now? Experiencing challenges while working towards their goals, and learning how to take constructive steps forward provides a critical growth mindset, a true advantage to have when stepping out into the adult world. This is an especially impactful outcome given the challenges that can occur keeping communication lines open and meaningful as kids go through the pre-teen and teen years. The conversations stimulated because of the GISS method of managing decisions are based on the goals matter to your child, not you. They are directing the conversation. Staying connected through these valuable discussions allows your child to explore ideas for their future frequently and consistently, with you in a supportive role. Knowing their ideas are valued gives them a stronger sense of self-worth and independence. By discussing their goals, they gain more clarity as they look at the pros and cons, and the questions they’ll need to answer to make a decision. All of these factors add up and help the child or teen feel more capable and confident because they have had a chance to “run” or manage their lives. They feel proud of the accomplishments they are making, and the lessons they’re learning along the way. They also develop perspective through the hands-on process and varied experiences, and they begin to realize how much control they actually do have over the present and future situations. Following a process increases competence and ultimately confidence in life because you begin to know what to do to get the results you want. Our children can build their confidence to set bigger goals with this process because they have been able to see their own progress along the way. This cycle enables leadership and direction of their decisions and actions, and their positive feelings from the experience directly impacts their attitude and optimism, key ingredients for personal success.